We offer Luxury & Standard Minibus Hire with driver for Buckingham and surrounding areas. You can hire our Luxury or Standard Minibus hire with driver 6, 8, 12, 14, 16, 25, 32 seater coaches. It is full of fun things to do for your family. If you want to visit historical places, you will love Buckinghamshire. It is one of the oldest area in the country. With many historical places. •	Chantry Chapel, this is the oldest building in Buckingham, when it was built it was used as a hospital and later transformed into the royal Latin school. After all these changes, it has kept the original 15th century doorway. This building is one of the most visited place in Buckinghamshire area. •	The Buckingham Old Gaol Museum, this building was built in 1839, this place is great for the whole family and make you day memorable, there is a gift shop selling all sorts and souvenirs to take the memories with you. You will also find the information Centre. So book a Minibus with driver 6-32 seater coach for visit of this famous place. All our vehicles filled with all the safety features, fully Air-conditioned. Our drivers will take care of your every need and will make sure you enjoy your trip. Executice Taxis, Luxury & Standard Minibus Hire with driver 8, 12, 16, 22 & 33 Seater, Covering Buckingham and all suurounding areas. 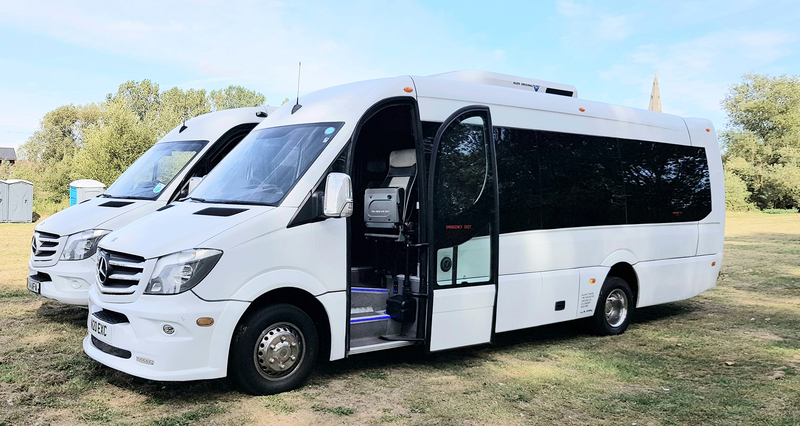 If you are looking for an Executive Taxis or 8-22 seater Minibus hire in Buckingham, with a driver, you are in the right place! Minibus Hire Buckingham is the ideal way for you to transport smaller groups of guests to any destination. We offer Executive Taxis, Luxury & Standard Minibus hire with Driver in Buckingham and Surrounding villages. You can hire our Executive Taxi Service, Luxury or Standard Minibus 8, 12, 14, 16, 19 & 22 seater at affordable prices. If you want to visit historical places, you will love Buckinghamshire. It is one of the oldest area in the country. With many historical places.Chantry Chapel, this is the oldest building in Buckingham, when it was built it was used as a hospital and later transformed into the royal Latin school. After all these changes, it has kept the original 15th century doorway. This building is one of the most visited place in Buckinghamshire area.The Buckingham Old Gaol Museum, this building was built in 1839, this place is great for the whole family and make you day memorable, there is a gift shop selling all sorts and souvenirs to take the memories with you. You will also find the information Centre. You can book online or call on our 24/7 booking helpline number i.e. 03333 444 165/ 07459 686670.